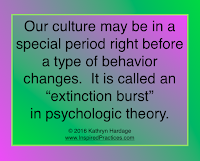 Extinction Burst is a term from behavior psychology, originating with Dr. B.F. Skinner. It refers to the phenomenon of a type of behavior hitting an extreme high right before it is discontinued and exterminated. For example, a child may have gotten results by throwing tantrums in the past, but when his parents learn not to reward the tantrums, they may continue and even get worse before the child realizes there will be no more reward for bad behavior and stops throwing tantrums. Our culture may be at this point in its evolution. We are seeing the worst of racism, which has hidden underground for many years since the Civil Rights Act. We are seeing the worst economic divide, with Wall St. taking advantage of the newest generation of students. We are seeing the 1% manipulate politics as well as commerce. We are seeing self-interest to an extreme. And we are also seeing world awareness on a scale never possible before internet communications and news reports could be made immediately. Good behavior in the form of stewarding the planet, its resources and its people is going on in many places. Good practice in honoring systems which really work needs more attention. We are certainly in the middle of interesting and challenging times. 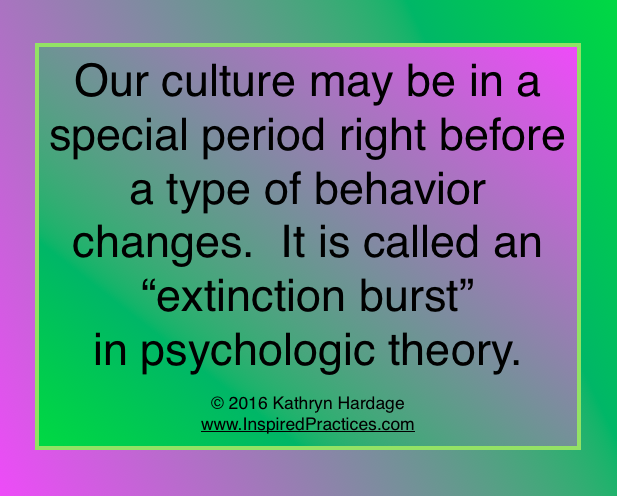 We will see what this “extinction burst” brings us.